A 5-bedroom chalet which can sleep 10, situated in the resort of Grimentz in Switzerland. Chalet 907 has a Fireplace, TV and Wifi, and is available for holiday rent on a Self catering basis. Conveniently located near to both the piste and centre of the Swiss alpine resort of Grimentz. Residences Grimentz 977 has 4 bedrooms and can accommodate upto 8 people on a Self catering basis. Offering holiday accommodation in Grimentz on a Room only basis, La Marmotte is a 4 bedroom chalet that can comfortably accommodate 8 people. Conveniently located near to the pistes of the Swiss resort of Grimentz. La Marmotte has 4 bedrooms and can accommodate upto 8 people on a Room only basis. Offering holiday accommodation in Grimentz on a Self catering basis, Tarcianne B11 is a 2 bedroom apartment that can comfortably accommodate 6 people. The property also features a TV and Wifi. This 2 bedroom apartment is located in the Swiss resort of Grimentz. Available on a Self catering basis, Tarcianne A13 can sleep upto 4 people. This apartment also features a TV and Wifi. Offering holiday accommodation in Grimentz on a Room only basis, Les Clarines is a 3 bedroom chalet that can comfortably accommodate 6 people. The property also features a Fireplace and Wifi. A 3-bedroom chalet which can sleep 6, situated in the resort of Grimentz in Switzerland. Les Clarines has a Fireplace and Wifi, and is available for holiday rent on a Room only basis. This 5 bedroom chalet is located in the Swiss resort of Grimentz. Available on a Room only basis, Chalet Bambi can sleep upto 11 people. This chalet also features a Fireplace and Wifi. Featuring a Fireplace and Wifi, Chalet Bambi offers comfortable holiday rental accommodation in Grimentz on a Room only basis. 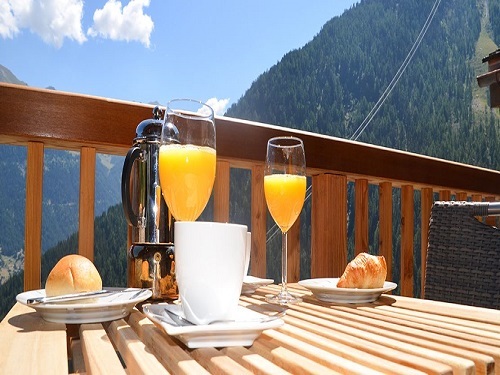 Chalet Bambi is a 5 bedroom chalet that can comfortably accommodate 11 people.